From the mid-sixteenth to the mid-eighteenth century, the French, Spanish, and English battled for control of North America. According to Francis Parkman, Spanish civilization crushed the Indian; English civilization scorned and neglected him; and the French embraced and cherished him. The problem was that the French lost all claims to North America during the French and Indian War. After 1763, tribes like the Iroquois and the Seneca were therefore in a defensive position as British colonists began encroaching on their lands. Several Indian chiefs and spiritual leaders decided to combat European colonization. Some, like the western Delaware prophet Neolin, preached against the evils of alcohol and European goods. Others, like Chief Pontiac of the Seneca, gathered his tribal warriors and attacked British forts and garrisons. By June of 1763, Pontiac's multi-tribal alliance controlled nine of the twelve British-held forts west of the Appalachian Mountains. Despite the fact that British reinforcements re-took the forts, King George issued a proclamation forbidding colonists from settling west of the mountains. The royal Proclamation of 1763 upset crowded colonists hungry for more land, pushing America closer to Revolution. This lesson lets students explore the role of Native American politics and warfare in the events of colonial America. When England, France, Spain, and the Netherlands first set out to colonize North America in the mid 1500s, it was obvious that there would be competition for land claims and empire in the new world. In the 1560s, Spain and France raced to found a permanent settlement situated near the Gulf Stream on the east coast of North America that could become a major center for trade. Pedro Menendez founded the Spanish colony of San Augustine, which was repeatedly attacked by the English and the French. Unable to defeat the much stronger Spanish, France and Britain had no choice but to start settlement higher up the east coast. France ended up in Canada, and the English in Virginia and New England. The competition for control of the North American continent would continue among these three European nations for several centuries. The European powers settled different areas in North America, and had very different relationships with the local Indian tribes. Spain controlled what is now Florida as well as the Southwest into present day California. In South and Central America, the Spanish used the Native Americans as slave labor to mine for precious metals to be sent back to the crown. In the area that is now the United States, however, the Spanish founded small agricultural settlements and mission villages which were primarily used to control the local Indian population and ensure their allegiance in the case of an attack by the French or English. France's influence extended over much of the Mississippi and Ohio valleys, and their interactions with the Native Americans were vastly different than those of the Spanish or the English. The French sent few settlers, and those that did come over were mostly trappers involved in the highly lucrative fur trade. These men often married into the local tribes. Their Indian wives taught the trappers native customs as well as the language. England claimed the east coast of the continent from present day Maine through, eventually, Georgia. Unlike the Spanish and the French, the English brought families intending to settle the land permanently. The English whaled, farmed, fished, and planted cash crops in the land they claimed. The population of the English colonies far outstripped the populations of New France and New Spain. In addition, the English cleared large parcels of land for farming, forcing the Native Americans in the area from their traditional hunting grounds. This uneasy balance of power continued throughout the 17th and early 18th centuries. However, by the mid 1700s the population in the British colonies was expanding rapidly and many colonists were eager to expand their land claims as well. Starting in the 1740s, British and colonial traders began to cross the Appalachian Mountains and push into the Ohio River Valley. Their intention was to take part in the profitable fur trade that the French had previously monopolized. The French, of course, were loath to lose their revenue base. Knowing that conflict over this land would continue, both England and France sought allies among the Native American tribes in the area. As the French in North America were generally less hostile toward the Native American way of life than the English, France was able to form friendly relations with the great majority of nations in the area. The Algonquins, the Huron, the Seneca, the Delaware, and other tribes joined loosely with the French. Britain tried to negotiate an alliance with the Iroquois Confederation, a partnership of six nations that included the Seneca. The leaders of the Iroquois met with the British, but chose not to form an alliance. Neither, however, did the confederation ally with France, although individual tribes were free to do so. From 1754 to 1763, the French, British regulars, Native Americans, and English colonists fought the French and Indian War, also known as the Seven Years' War. In the beginning, the French were victorious, often because they relied on their Indian allies' advice, whereas the British dismissed the Indians as little more than slaves. Eventually it became clear that the British had the advantage due to greater numbers and greater resources. In response, the Iroquois chose to form an alliance with the British in the hopes of maintaining trade agreements. In doing so, they pulled the Seneca and their clients, the Delaware, away from the French, which contributed to France's eventual defeat. The Treaty of Paris, signed in 1763, ended French power in North America. England now claimed almost all land in North America east of the Mississippi River. English colonists eagerly began moving to the lands newly acquired; particularly land in the Ohio River Valley and near the Great Lakes. Although the British had official control of these areas, French traders still populated the area and communicated with the local tribes. Many of these were tribes that had not actively participated in the French and Indian War, but had nonetheless hoped for a French victory. The British were not as generous with the tribes as the French had been, nor were they as respectful of the Native Americans. Also, the local tribes feared the coming of English settlers who would destroy their way of life, unlike the French. Their uncertainty and anger was encouraged by the French still residing in the area. Spirituality deeply influenced the actions of the Indian nations in the Great Lakes region in the aftermath of the French and Indian War. In the years preceding the war, several prophets had emerged among the Delaware of the Susquehanna Valley. Initially, these prophets denounced alcohol, symbolic of Indians' dependence on Europeans, as the cause of the natives' downfall. This message was expanded upon during the French and Indian War, when other prophets preached that not only alcohol, but also European trade goods were leading Indians astray. This message became a pan-Indian call to war with the emergence of the prophet named Neolin among the western Delawares of the Ohio River Valley in the late 1750s. Neolin preached that the Master of Life had made the Indians separate from both white and black men and the Indians had displeased the Master of Life by allowing themselves to be seduced away from the old ways. He pointed to the epidemics and the loss of hunting grounds as evidence of the Master of Life's disappointment. Neolin developed rituals to purge the nations of colonial influence, and advocated a seven year process by which to train young men in the old ways of war. As the situation with the British in the Ohio River Valley worsened, Neolin's teachings became more popular, and tribal leaders who were willing to compromise with the colonists lost power. The combination of encouragement from the French, distrust and dislike of the British, and a spiritual revival that called for a return to the ways of the past led to violence between the Indian nations of the Ohio River Valley and the British troops stationed there. The Seneca, who had led an uprising against the British in 1761, again sought to begin hostilities with the British by sending warbelts to the tribes throughout the Great Lakes region. 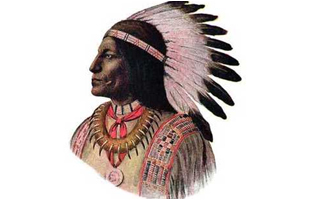 Inspired by the warbelt and Neolin's teachings, Chief Pontiac of the Ottawa convinced the Ottawa, Potawatomies, and Wyandot to join him in attacking the British fort at Detroit. Pontiac was to enter Fort Detroit with several of his warriors under the pretence of a peaceful meeting with its commander, Major Henry Gladwin. Once inside, the warriors would draw their weapons from hiding and attack the Major and his officers. Indian forces waiting outside the gates would then finish off the rest of the unprepared soldiers and Fort Detroit would fall into Native American hands. Unfortunately for Pontiac, Gladwin learned of the plan. When Pontiac and his warriors were admitted to the fort on the chosen day, they found a military presence that was fully armed and ready to repel an attack. Pontiac left the fort but returned several days later with a full attack party and began the siege of Fort Detroit. As news of Pontiac's attack on the British spread throughout the region other groups of Indians began attacking the local British garrisons. The Seneca, the Shawnee, the Miami, the Wyandot, the Huron, the Chippewa, and the Delaware eventually joined in the attacks. Although stealth had failed in Detroit, it was successful at other British outposts. By June of 1763, Native Americans controlled all but the three most important of the twelve British posts west of the Appalachian Mountains: Fort Detroit, Fort Niagara, and Fort Pitt. Attacks were made against settlers on the western frontier, and colonists fled their homes to the safety of the remaining British-held forts or back to the British colonies. The British sent reinforcements and supplies to the beleaguered garrisons, and eventually regained control of the posts. The siege of Detroit lasted the longest, until October 15 of that year. At that point, however, Pontiac realized that without European allies, and with the approach of the hunting season, he would not be able to keep his coalition together. Furthermore, it was clear that the French had indeed lost and would not be regaining control of the land, so the Indians allied with Pontiac sued for peace with the British in hopes of maintaining some trade agreement. Pontiac was forced to abandon the siege and retire north. Although the British were victorious against the Native American forces in the Great Lakes region, the six month engagement had its cost in lives lost, supplies and weapons bought, and salaries paid out. The British were already deeply in debt as a result of the recently won French and Indian War. The crown owed 146 million pounds in 1763. The British government realized that if settlers continued to cross the Appalachians there would be continued violence between the British and the Native Americans. Unwilling to bear the cost of protecting his newly won land, King George issued the Proclamation of 1763 which held all land west of the Appalachians for the Native Americans and forbade colonists to settle upon it. The colonists, of course, disagreed with this policy. Many wondered why they had fought the French and Indian War of they were to be unable to reap the benefits of their victory. Colonists became disillusioned with the king and Parliament. Pontiac's War led directly to the Proclamation of 1763, which is often held to be the beginning of the road to the American Revolution, a revolution that would prove disastrous for North American natives. Anderson, Fred. Crucible of War: The Seven Year's War and the Fate of Empire in British North America, 1754-1766. New York: Alfred A. Knopf, 2000. Cave, Alfred. The French and Indian War. Westport: Greenwood Press, 2004. Dowd, Gregory. War Under Heaven: Pontiac, the Indian Nations, and the British Empire. Baltimore: Johns Hopkins University Press, 2002. Flavin, Francis E. "A Pox on Amherst: Smallpox, Sir Jeffery, and a town named Amherst." Historical Journal of Massachusetts 30.1 (2002). Debt: Money owed that must be repaid. How did Britain's land claims change as a result of the French and Indian War? Britain gained land to the Mississippi River. What advantages did Britain gain with their new land? This land was fertile, and settlers could farm it. Also, the area around the Great Lakes was valuable for fur trapping. How did Spain's land claims change as a result of the French and Indian War? Spain gained land from Mexico to the Mississippi River. What advantages did Spain gain with their new land? Spain now controlled the mouth of the Mississippi River, New Orleans, which was a strategic port. How did the Seven Years' War impact French land claims in North America? The French no longer had any land claims in North America. Explain to students that changes in land claims were not the only results of the French and Indian War. Although England won, by the end of the war she was about 146 million pounds in debt. Distribute Resource Sheet #2, "Chief Pontiac's Speech." Allow students 7 minutes to work with a partner to read the speech and complete the T-chart at the bottom of the page. Have several students share the information that they recorded in their T-chart. Record this information on a projected copy of Resource Sheet #2. Students should record the information on their resource sheets. Allow students 5 minutes to complete questions 2, 3, and 4 on Resource Sheet #2. Discuss responses with students. Display a transparency of Resource Sheet #3, "Pontiac's War." Have students read the brief description of Pontiac's War. What was the outcome of Pontiac's War? The English remained in control of the land. Was anything settled between the Indians and the British in 1763? No treaty was signed, there was still animosity between the two groups. What might happen if more American colonists settle on the land near the Great Lakes and the Ohio River? Indians might attack the settlers because they are infringing on Indian land. What were the costs in lives of Pontiac's War to the British? British soldiers were killed, British forts were destroyed, British colonists were killed, British colonists lost their homes, Britain had to pay all of the soldiers who fought, Britain had to provide food, clothing, weapons, and ammunition for the soldiers to fight. What were the costs in money of Pontiac's War to the British? British forts were destroyed, British colonists lost their homes, Britain had to pay all of the soldiers who fought, Britain had to provide food, clothing, weapons, and ammunition for the soldiers to fight. Why would these monetary costs pose a problem for the British? They were already heavily in debt from the French and Indian War. Have students make predictions about what might happen next. How will the British deal with the fact that there is a hostile force on their frontier? How will they handle their debt? Assess student understanding by distributing Resource Sheet #4, "Joining Chief Pontiac?," and having students complete the activity. Have students convert 146 million pounds in 1763 into modern dollars using the calculators on http://eh.net/, a website owned by the Economic History Association with support from the Business History Conference, the Economic History Society (UK), and the History of Economics Society). Have students read excerpts from eyewitness accounts of attacks during Pontiac's War. Such accounts are available at http://www.uwo.ca/english/canadianpoetry/eng%20274e/henry.htm or http://www.americanjourneys.org/aj-135/summary/index.asp. RS #4 Joining Chief Pontiac? Peckham, Howard H. Pontiac and the Indian Uprising. University of Chicago Press, 1947. � 1947 by The University of Chicago. All rights reserved. This speech was given to an assembly of Ottawa, Huron, and Potawatomie Indians on an island in the Detroit River, May 5, 1763. Pontiac compares the way that the French dealt with the natives to the way that the English dealt with them. Students will analyze this document to determine Pontiac's feelings towards the British and the French, and whether he was pleased with the results of the French and Indian War.